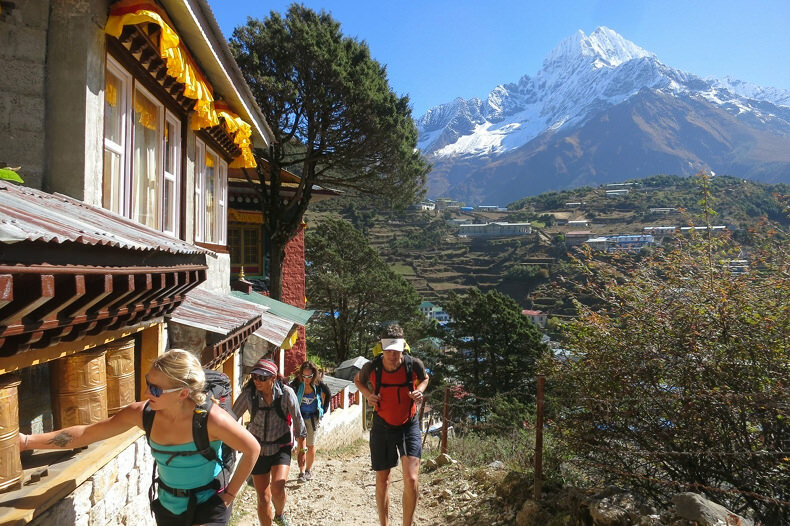 Trek to Everest Base Camp and gain unparalleled perspectives while trekking alongside Sherpa, guides, and climbers who are continuing on to the summits of Everest and Ama Dablam. Experience Nepal's culture and learn its history while trekking in the beautiful Khumbu Valley. 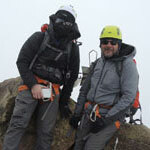 We use premier logistics that are the same as those used on the region's high altitude climbing peaks. Mount Everest has long captured the imaginations of people the world over. The fact that its summit is the highest point in the world speaks for itself, but when traveling in the Khumbu Valley, it becomes apparent that it’s not only Mount Everest’s most famous statistic that makes this place so special, but the greater picture of the mountain range, including the history, the weather, the people who live there, and the climbers who visit. When trekking in the Khumbu Valley with Alpenglow Expeditions, you become a part of the community of mountain enthusiasts that migrates to this region in order to pursue their dreams. As you travel and trek beside the sherpa, guides, and climbers who continue on to the summits of the surrounding peaks, you will get a perspective unlike any other. You will gain an understanding of the region’s culture, its history, and the sport that brought you there. We have two similar programs for the spring and autumn Himalayan seasons. Our autumn trek accompanies expeditions on their way to Ama Dablam. Trekkers with Alpenglow Expeditions in the Khumbu are extremely fortunate to be able to utilize the same high-level logistics as those used on the region’s high altitude climbing peaks. 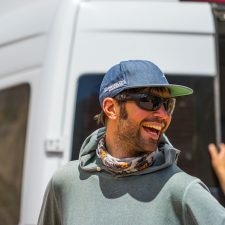 With our support staff, guides, accommodations, and food being the best in the business, you are able to focus your energy on yourself and your surroundings. 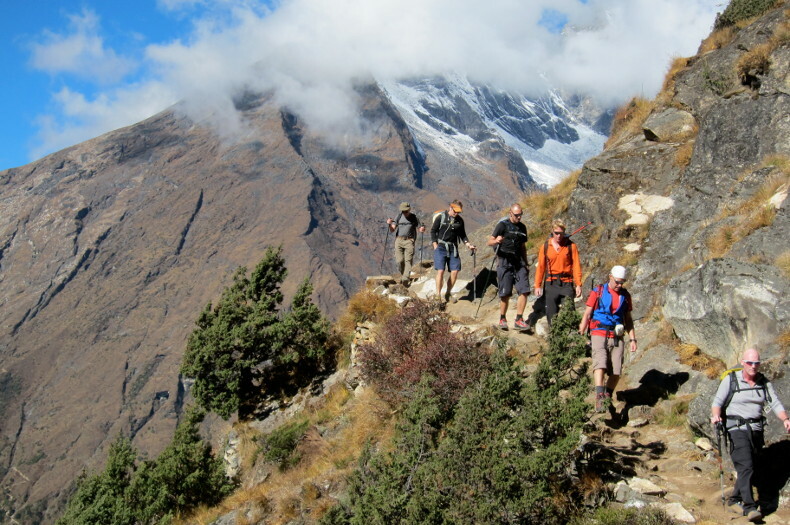 Come to the Khumbu with us and find yourself on the adventure of a lifetime! Arrive in Kathmandu, Nepal (4,600 feet/1,400 meters). We transfer to our hotel, and begin the process of getting over jetlag. Today we explore some of Kathmandu’s most famous sites. These include Swyambunath (the Monkey Temple), Pashupati (Nepal’s largest Hindu temple), Boudanath (Kathmandu’s most important Buddhist temple) and the old city’s original central square, Durbar. We also have our first team meeting, and organize our bags for the trek. 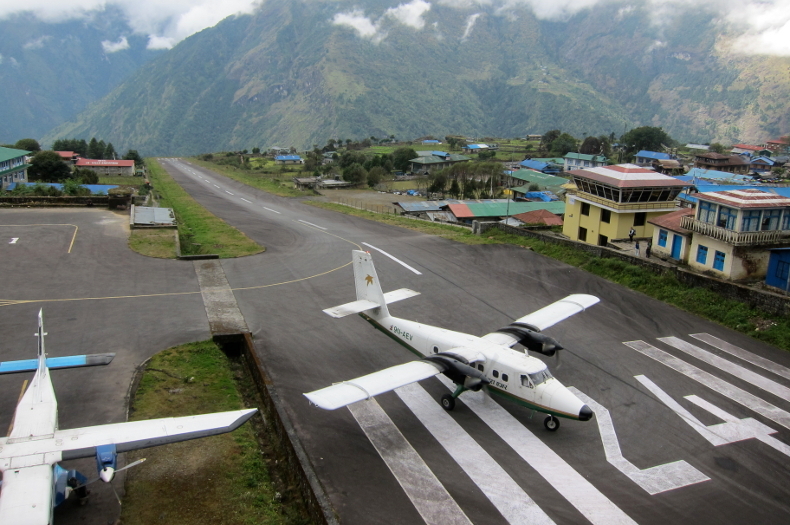 Fly Kathmandu to Lukla (9,000 feet/2,743 meters), 45 minutes. Trek Lukla to Monjo (9,300 feet/2,835 meters), 3-5 hours. One of the most beautiful and memorable mountain flights in the world, our 45-minute flight takes us from Kathmandu to Lukla, the town where we begin our trek to base camp. After organizing our yaks and porters we begin the half-day hike to the town of Monjo. The trail is excellent, and after descending to the town of Phakding, climbs easily from the river and across our first suspension bridges up to our lodge in Monjo. 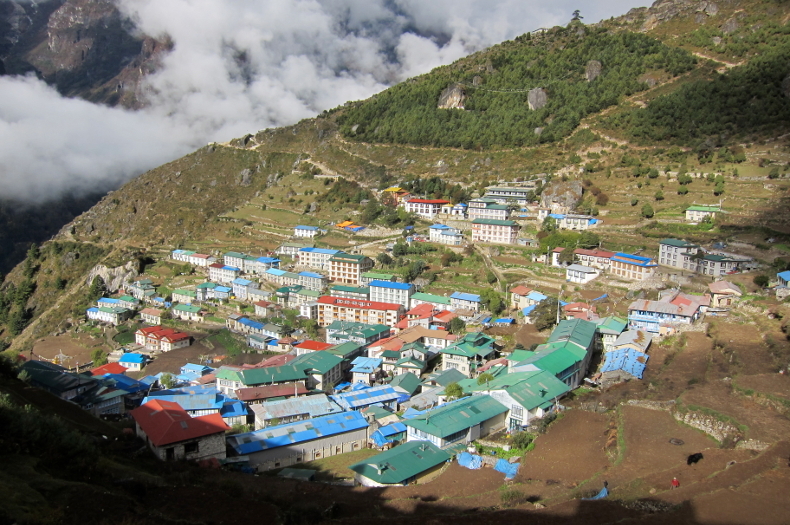 Trek Monjo (9,300 feet/2,835 meters) to Namche Bazaar (11,300 feet/3,444 meters), 3-4 hours. The walk begins with a couple of thrilling suspension bridges and wanders along the banks of the raging Dudh Khosi River, before climbing steeply up a 2,000 foot (610 meter) hill into Namche Bazaar. This hill is the first of our challenging climbs. Along the way we are rewarded with our first views of Mt. Everest, and plenty of well-built stone terraces to stop and rest. We have lunch in Namche Bazaar, and spend the afternoon exploring the vibrant town. Namche is the most important town in the Khumbu Valley, and is filled with fun shops, great bakeries, and colorful winding streets. We also visit the local monastery and the Sherpa Museum of Culture and Himalayan Climbing History. The museum’s exhibits chronicling sherpa climbing history are not to be missed. Trek Namche Bazaar (11,300 feet/3,444 meters) to Khumjung (12,400 feet/3,790 meters), 1 hour. For acclimatization purposes we spend a second night near Namche Bazaar. After a relaxing morning exploring town and enjoying our first stunning views of Ama Dablam from a viewpoint above town, we have lunch and then take a one-hour walk to Khumjung and our sirdar’s (lead sherpa’s) home. We spend the night with Phurba Tashi and his family in his comfortable lodge, and possibly visit the Hillary School in Khumjung, and the Khunde hospital, both projects of Sir Edmund Hillary, and significant centers of Sherpa life. Trek Khumjung (12,400 feet/3,790 meters) to Phortse (12,450 feet/3,800 meters), 3 hours. Phortse is home to most of our sherpa team. It is a mountain town perched on the walls of a massive river valley and sees few Western visitors. To get there we set off on small trails, featuring a long stone staircase through vertical rock cliffs that ends at the Mong La, a high pass with striking 360 degree views of Ama Dablam, Thamserku, and Kantegri. We descend to the river then climb easily to Phortse, arriving in time for lunch. We spend the afternoon visiting our sherpa team in their homes, drinking tea and tasting the locally made yak yogurt. Trek Phortse (12,450 feet/3,800 meters) to Dingboche (14,800 feet/4,530 meters), 5-7 hours. We begin today’s trek far from other trekkers on the trail from Phortse to upper Pangboche. In Pangboche we visit the oldest monastery and temple in the region and explore its paintings and statues. If we are fortunate, we may also receive blessings from the local lama. Once finished, we continue hiking to Dingboche, a small seasonal town perched at the base of Lhotse’s South Face that has incredible views of Ama Dablam’s North Ridge. Rest day in Dingboche (14,800 feet/4,530 meters). Optional climb of Chukkung Ri (17,600 feet/5,364 meters), 6-8 hours. Chukkung Ri is not glaciated, but provides an excellent way for us to gain additional acclimatization, as well as stunning views of Lhotse’s South Face and the huge glaciers filling the Amphu Valley. In the afternoon we return to Dingboche. As needed, this day also makes for a great rest and recuperation day prior to continuing higher in the Khumbu Valley. Many shorter day hikes also exist around the town of Dingboche offering an opportunity to explore without attempting the complete climb of Chukkung Ri. Trek Dingboche (14,800 feet/4,530 meters) to Lobuche (16,109 feet/4,910 meters), 4-6 hours. We say goodbye to the Ama Dablam climbing team this morning, and then take our time and move slowly as we move considerably higher in the valley. The walk to Lobuche follows a high plateau with beautiful views of the surrounding peaks and yak herders’ huts, before crossing a small river and climbing steeply above the town of Dughla to the Everest memorial zone. Here there are stone memorials and plaques to many of the local and international climbers who have been lost climbing Everest and the Khumbu’s other big peaks. After some time here to take in the beauty of this place, we continue up the valley to Lobuche. Trek Lobuche (16,109 feet/4,910 meters) to Gorak Shep (16,942 feet/4,910 meters), 3 hours. 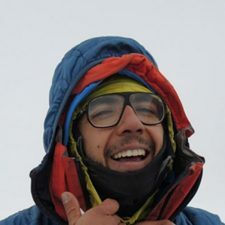 Optional climb of Kala Patar (18,192 feet/5,164 meters), 4 hours round-trip. Today, although not long, is quite challenging due to the altitude and occasionally difficult trail. After an early morning start, we follow the valley next to the Khumbu Glacier all the way to the final Sherpa settlement of Gorak Shep. If the weather and views warrant, we may choose to climb Kala Patar this afternoon to see sunset on Everest’s South Face. Summiting Kala Patar is a non-technical but strenuous hike on good, generally snow-free, trails. The views of Everest from its summit are the best anywhere in Nepal, and well worth the hard hike. We spend the night in a lodge at Gorak Shep. Trek Gorak Shep (16,942 feet/4,910 meters) to Lobuche (16,109 feet/4,910 meters), 2 hours. Optional hike to Everest Base Camp (17,575 feet/5360 meters), 3-4 hours round trip. Depending on our day yesterday, we may wake early to summit Kala Patar this morning. We also have the option to hike to Everest Base Camp at the foot of the Khumbu Icefall. In the autumn the base camp is quiet, but still a stunning place to visit. In the afternoon we descend all the way to Lobuche. Trek Lobuche (16,109 feet/4,910 meters) to Pangboche (12,894 feet/3,930 meters), 5 hours. 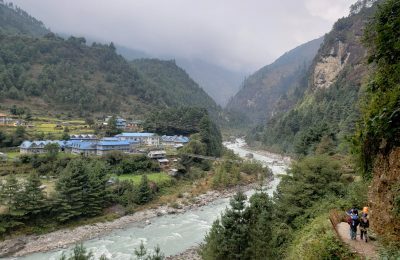 Along the way we visit the town of Pheriche, home to the HRA (Himalayan Rescue Association), an important medical clinic that treats both foreign trekkers and the local Sherpa. We will also enjoy having more oxygen for our bodies, warmer temperatures, and re-entering the world of trees and vegetation after the stark beauty of Everest. We spend the night in one of our sherpa’s lodges in Pangboche. Trek Pangboche (12,894 feet/3,930 meters) to Ama Dablam Base Camp (14,500 feet/4,420 meters), 3-4 hours. Today we make a short but steep climb away from the main tourist track to visit our climbing team in Ama Dablam Base Camp. This base camp may be the most beautiful in Nepal, with unbelievable views of Ama Dablam and a perfectly flat grassy valley with a river running through it. We enjoy a comfortable night in tents, and food from the best chef in the mountains. Rest day in Ama Dablam Basecamp (14,500 feet/4,420 meters). Optional hike to Ama Dablam Yak Camp (17,100 feet/5,200 meters), 6-7 hours round-trip. Since our climbing team and Sherpa will all be here preparing for their climb of Ama Dablam, this is an opportunity to see the inner workings of a major Himalayan climbing expedition. 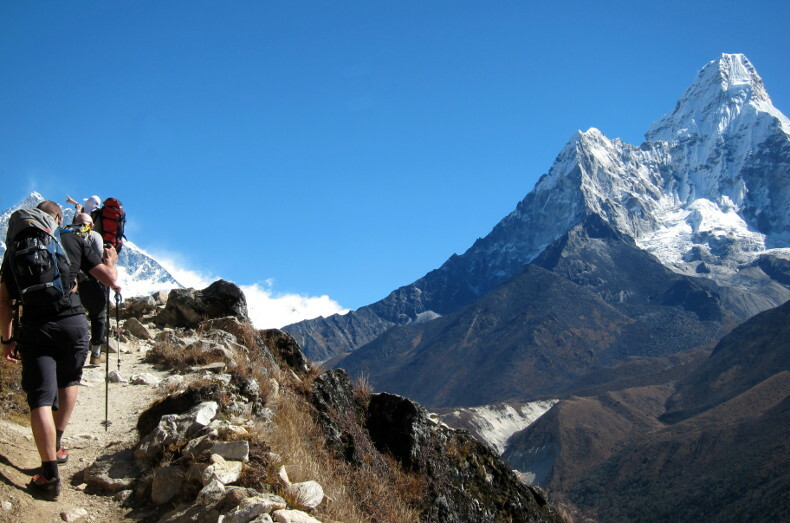 For trekkers that are feeling strong, there is an optional hike to Yak Camp on Ama Dablam. This hike gives a close-up view of the technical Southwest Ridge on Ama Dablam, our climbing group’s route of ascent. We spend a second night in tents at Ama Dablam Base Camp. Trek from Ama Dablam BC (14,500 feet/4,420 meters) to Thyangboche (12,664 feet/3,860 meters), 4-5 hours. We leave base camp in the morning and hike down the hill to Pangboche. After tea we continue down the valley and through thick rhododendron forests to Thyangboche. Thyangboche is home to the most important and active monastery in the Khumbu and we will spend the afternoon visiting the monastery and monks and watching a traditional Tibetan Buddhist ceremony. Trek from Thyangboche (12,664 feet/3,860 meters) to Namche Bazaar (11,300 feet/3,444 meters), 5 hours. Our walk begins with a big drop down to the Dudh Khosi River and a stunning suspension bridge. After crossing the bridge we climb again to our lunch spot in Sanasa. After lunch, we continue contouring along hillsides and over small ridges until dropping into Namche Bazaar. Trek from Namche Bazaar (11,300 feet/3,444 meters) to Lukla (9,000 feet/2,743 meters), 5-7 hours. Our final day of walking covers the same ground we spent 2 days climbing on the way in. Now that we are acclimatized we cover the distance easily, and enjoy the many suspension bridges, tumultuous rivers, small towns and monasteries. After lunch in Phakding, the trail climbs a final 600 vertical feet (180 meters) to the airstrip in Lukla, and our final lodge where we spend the night. Fly Lukla (9,000 feet/2,743 meters) to Kathmandu. This 45-minute flight begins with one of the most exciting takeoffs in the world. Once airborne, there are incredible views of the mountains, the foothills, and finally the city. After landing in Kathmandu we return to our hotel for an evening of celebration. Night in hotel. Contingency day for flights from Lukla to Kathmandu. Since the flights to and from Lukla are often delayed or cancelled due to bad weather in the mountains, this is an essential extra day. If we arrive back in Kathmandu on time, this day can be used for sightseeing in the city, shopping for souvenirs, or sleeping in and enjoying the fantastic pool at the hotel. 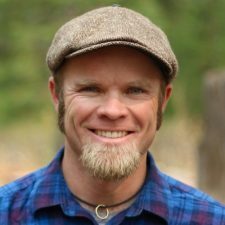 Would you consider doing a custom trek in the Himalaya? We always welcome custom expeditions and treks. 50% of Alpenglow’s expeditions are customized.